The Boys and Girls Clubs in New Jersey held their annual Youth of the Year Gala this past Tuesday, June 6 at Montclair State University. Olympian and New Jersey Native Laurie Hernandez was the the master of ceremonies. Laurie is pictured here with Susan Haspel, State Director of The Boys and Girls Clubs in New Jersey and our very own Chris Rosica, President of Rosica Communications. 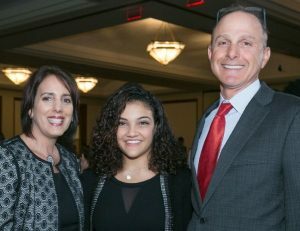 This entry was posted in Rosica News and tagged Chris Rosica, Laurie Hernandez, Montclair State University, MSU, Rosica, Susan Haspel, The Boys and Girls Clubs in New Jersey, Youth of the Year, YOY.